o By all means, marry. If you get a good wife, you’ll become happy; if you get a bad one, you’ll become a philosopher. o The only true wisdom is in knowing you know nothing. o Beware the barrenness of a busy life. o Wisdom begins in wonder. o The way to gain a good reputation is to endeavor to be what you desire to appear. o A system of morality which is based on relative emotional values is a mere illusion, a thoroughly vulgar conception which has nothing sound in it and nothing true. o The greatest way to live with honor in this world is to be what we pretend to be. o He is richest who is content with the least, for contentment is the wealth of nature. o False words are not only evil in themselves, but they infect the soul with evil. o Let him that would move the world first move himself. 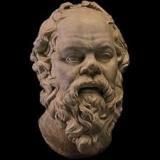 To learn more about Socrates, please click here.